The memorization involved in learning multiplication tables can be frustrating for many children. They may also not really understand what multiplication is all about. You can most easily help these students when you understand what kinds of help they need. Do they understand what addition is? Do they know their addition facts? Do they understand what subtraction is? Do they know their subtraction facts? Back up as necessary to be sure your students fully comprehend addition and subtraction concepts. Re-teach any facts that haven't been learned. Then be sure they grasp the basics of multiplication. Multiplication is a shortcut for adding a number to itself a specified number of times. Demonstrate this concept on the board until it's clear to the students. Multiplication can be understood as 'groups of.' Use manipulatives (e.g., buttons and an egg carton) to demonstrate this idea until you're sure the students understand it thoroughly. Once students have a handle on these two basics, they're ready to learn the facts. Here are some suggested activities for teaching the multiplication tables. Reading books, such as Amanda Bean's Amazing Dream by Cindy Neuschwander or Barrington and the Math Princess by Roxanne Eckenrode. Singing along with CDs, such as Hap Palmer's Multiplication Mountain or Disney's well-known Schoolhouse Rock: Multiplication. Making manipulatives in class using Fun-flap Facts: Multiplication by Danielle Blood or Scholastic's Monster Multiplication Wheels: Reproducible Patterns for 20 Interactive Wheels That Help Students Memorize the Multiplication Facts from 1 to 12. No matter how many fun ways there are to learn multiplication facts, children still must learn them well and be able to recall them quickly. Shortcuts help learning the multiplication tables and reduce the daunting task of learning so many facts to learning a few rules and facts. Let's look at a way to memorize the table from 0-10. There are 121 possible facts. 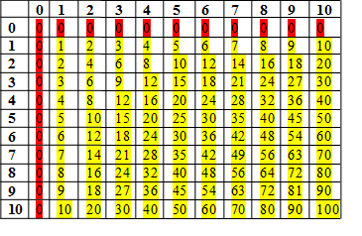 When we learn the first rule, 'any number times 0 is always 0,' it reduces the 121 facts to 100 (highlighted in yellow). The commutative property, 'syrup x pancakes = pancakes x syrup,' decreases the total number we need to memorize further to 55. We can memorize 3 x 5 = 15 and 5 x 3 = 15 together. The next rule, any number multiplied by 1 equals that number, removes a whole row, bringing the total down to 45. The rule that any number multiplied by 10 is that number followed by a 0 reduces the total down to 36. With only 36 facts now left to go, divide the table into four sections by drawing lines between the columns and the rows for 5 and 6 both horizontally and vertically. You can cross out the columns and rows for 0, 1 and 10 because they were covered by rules 1, 3 and 4. Have your students memorize the table from 2 x 2 to 5 x 5. Because of the commutative property, there are only ten facts to learn. When that's mastered, work on 2 x 6 to 5 x 9. The 16 facts here also cover the next section (6 x 2 to 9 x 5), so when these are learned, more than 3/4 of the table has been covered. Finish with ten facts from 6 x 6 to 9 x 9. Multiply by 5: The answer always ends in either 0 or 5. This sample worksheet shows you how to structure both basic and advanced multiplication tables. These formats are meant to help students memorize simple multiplcation problems and, when randomized, challenge them. Here are some ways to help your child learn multiplication and make fourth grade math homework fun.